The Bolton Council 'Local Plan' with its site allocations was adopted in 2014. It had been acknowledged by planners and Planning Inspector that Westhoughton had borne the brunt of development over many years, and that it couldn't really cope with much more building without undue pressure on infrastructure, services and quality of life. S.W.A.N. monthly committee meetings have continued: those stated goals of keeping a watching brief over development in Westhoughton remain the same. Below are current medium and large scale developments in Westhoughton. Roscoes Farm (ref: 93610/15): Due to concerns raised about this development a special consultation event was held on Tuesday, 24th March at The Carnegie Hall, Westhoughton, where residents could view plans and speak to the developer's agent and the Bolton Council Planning Officer. The extended consultation period ended on 1 May 2015. Recommended for approval by the Planning Officer, and being an allocated site on the Local Plan, the application was given the go-ahead by the Planning Committee on 27th August (11 votes to 9) - to refuse would have resulted in an appeal by the developer that the Council would have lost. After a short delay, the Section 106 Agreement was signed off (4/4/16) allowing for development of the site, subject to conditions, to begin. In the agreement there is monetary provision for off-site 'affordable housing', and local improvements: including Washacre Primary School, Hall Lee Bank Park (Local Nature Reserve), Central Park and Health Services. 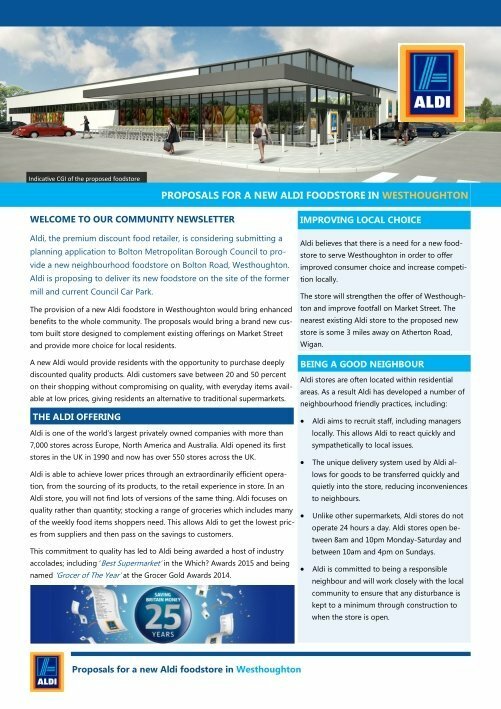 With a formal planning application now in (95552/15) and approved (10/3/16), a new Aldi supermarket is to be built on on brownfield land (Glebe Mill) adjacent to Westhoughton library. The land was previously ear-marked for a 'retirement village' (86502/11 - 2011) - the application subsequently withdrawn. The project will see the relocation of the council car park (to be accessed via Library Street) with an increased capacity of 76 cars, with the existing public car park given over to supermarket parking (99 spaces) accessed via Bolton Road. The consultation document is here. Approved - Bolton News article. The new development would add to shopping provision in the town centre - a strategic aim of Bolton Council - and should increase footfall on Market Street with the increased parking availability. Work on this site has now begun (95151/15) on this site off Church Street near Westhoughton railway station, comprising 28 dwellings. Approved (12/5/16). Work under way on this small fill-in development of 7 apartments on a former car park opposite Woodlands Care Home (former Red Lion site) (96482/16). Approved (30/6/16).